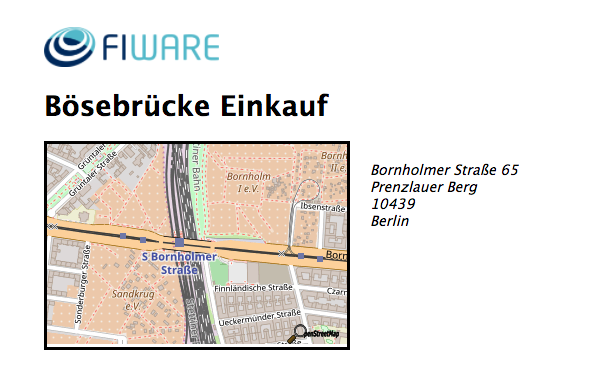 Description: This tutorial teaches FIWARE users how to alter the context programmatically. The tutorial builds on the entities created in the previous stock management example and enables a user understand how to write code in an NGSI capable Node.js Express application in order to retrieve and alter context data. This removes the need to use the command-line to invoke cUrl commands. The tutorial is mainly concerned with discussing code written in Node.js, however some of the results can be checked by making cUrl commands. Postman documentation for the same commands is also available. As you can see the business logic behind each request to access/amend context can range from the simple to complex depending upon business needs. The NGSI specification defines a language agnostic REST API based on the standard usage of HTTP verbs. Therefore context data can be accessed by any programming language, simply through making HTTP requests. Create a well formed URL. Make an HTTP GET request. Check for an error status and throw an exception if necessary. Return the body of the request for further processing. Since such boilerplate code is frequently re-used it is usually hidden within a library. Will generate a default ES5 npm package for NGSI v2 directly from the current specification. The aim of this tutorial is to improve developer understanding of programmatic access of context data through defining and discussing a series of generic code examples covering common data access scenarios. For this purpose a simple Node.js Express application will be created. The intention here is not to teach users how to write an application in Express - indeed any language could have been chosen. It is merely to show how any sample programming language could be used alter the context to achieve the business logic goals. Obviously, your choice of programming language will depend upon your own business needs - when reading the code below please keep this in mind and substitute Node.js with your own programming language as appropriate. The Store, Product and InventoryItem entities will be used to display data on the frontend of our demo application. 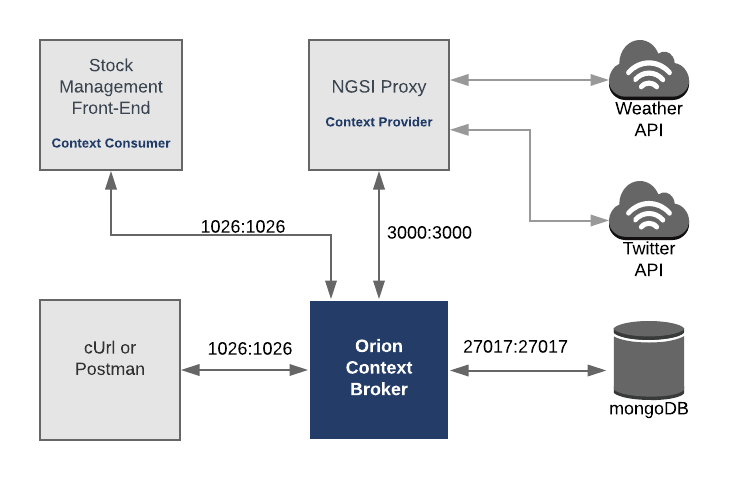 This application will make use of only one FIWARE component - the Orion Context Broker. Usage of the Orion Context Broker (with proper context data flowing through it) is sufficient for an application to qualify as “Powered by FIWARE”. Allow users to "buy" products and reduce the stock count. Tip Additionally, you can also watch the status of recent requests yourself by following the container logs or viewing information on localhost:3000/app/monitor on a web browser. We don't want to reinvent the wheel and spend time writing a unnecessary boilerplate code for HTTP access. Therefore we will use the existing ngsi_v2 npm library. This needs to be included in the header of the file as shown. The basePath must also be set - this defines the location of the Orion Context Broker. Indirectly this is making an HTTP GET request to http://localhost:1026/v2/entities/<store-id>?type=Store&options=keyValues. Note the re-use of the Store URN in the incoming request. For efficiency, it is important to request as few attributes as possible, in order to reduce network traffic. This optimization has not been made in the code yet. "description": "The requested entity has not been found. Check type and id"
The error object in the catch method hold the error response. This is then displayed on the frontend. This example reads the context data of the current InventoryItem entities for a given store and combines the information with the prices from the Product entities. The result is information to be displayed on the cash till. Multiple entities can be requested and aggregated by creating a Promise chain or by using Promise.all. 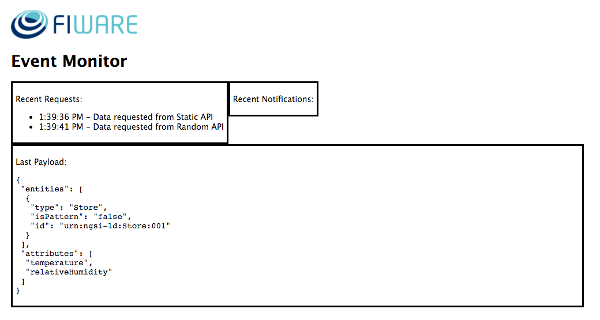 Here the Product and InventoryItems entities have been requested using the apiInstance.listEntities() library method. The presence of the q parameter in the request will filter the list of entities received. Again an error handler has been created to ensure that if any of the HTTP requests to the Orion Context Broker fail, an empty list of products is returned. Retrieving the full list of Product entities for each request is not efficient. It would be better to load the list of products from cache, and only update the list if prices have changed. This could be achieved using the NGSI Subscription mechanism which is the subject of a subsequent tutorial. Buying an item will involve decrementing the number of items left on a shelf. The example consists of two linked requests. 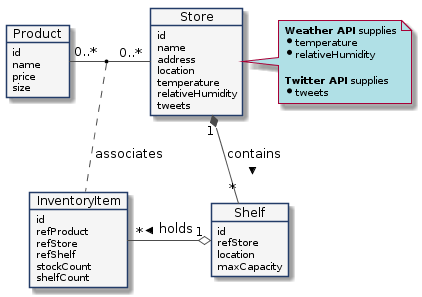 The reading of the InventoryItem entity data can be done using the apiInstance.retrieveEntity() method as shown previously. The data is then amended in memory before being sent to the Orion Context Broker using the apiInstance.updateExistingEntityAttributes() method. This is effectively just a wrapper around an HTTP PATCH request to http://localhost:1026/v2/entities/<inventory-id>?type=InventoryItem, with a body containing the elements to be updated. No error handling has been added to this function - it has been left to a function on the router. Care should be taken when amending the context to ensure that changes of state are committed atomically. This is not an issue in Node.JS since it is single threaded - each request but will execute each request one by one. However in multithreaded environments (such as Java for example) it could be possible to service two buy requests concurrently - meaning that the shelfCount will only be reduced once if the requests interleave. This issue can be resolved by the use of a monitor mechanism.